As I shuffled the cards to select this week's Intuitive Tuesday tarot card, I said, "Tell me what messages I need to bring to my readers this week." I selected The Star from the Aquarian Tarot Deck by David Palladini. I have previously covered The Star (reversed) here and The Star. If you remember The Star card is a card of hope, optimism, inspiration and luck. Even in the reversed position, it retains a lot of its positive attributes. 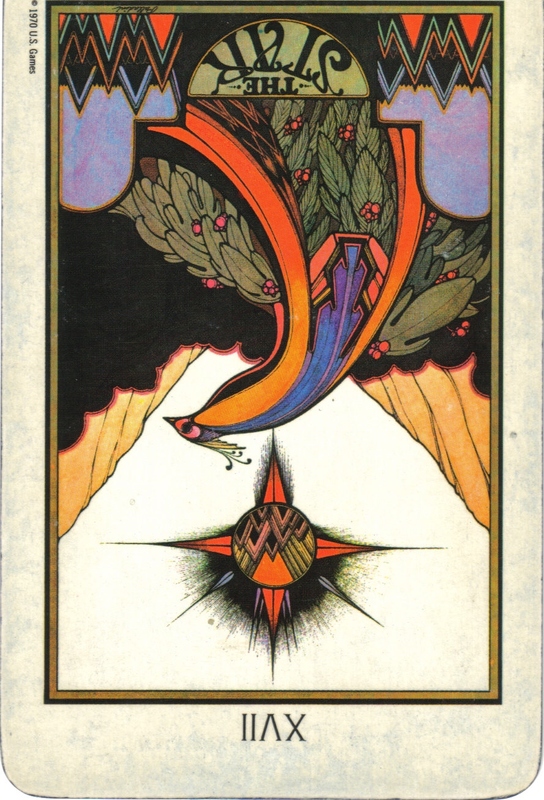 Remember that The Star is a Major Arcana card (indicating a spiritual or life lesson). 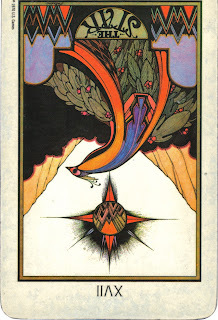 In the sequence of the Major Arcana cards, The Star follows The Tower. In a couple of my tarot decks, The Tower reminds me of watching television on the morning of 9/11 and seeing the Twin Towers in flames, breaking in half. On the cards, there are bodies flying out the windows, falling to the ground. When I was going through my divorce, The Tower repeatedly came up in my readings. It indicates a significant change, the collapse of a structure or an old way of life. It typically causes disruption, shock and pain. The more locked into the structure, the more painful it can be experienced. On the flip side, The Tower (even though painful and shocking), can also be liberating. I found some of my biggest intuitive and spiritual growth as I picked up the pieces and moved through my divorce. Perhaps you have experienced something similar in your life either with a relationship, a career, etc. The Star is that glimmer of hope that you see or feel or long for as the dust settles. Perhaps in the case of 9/11, The Star was the way people pulled together to help, donate and pray, not only for the loved ones lost, but for our nation and for mankind as a whole. The Star is also quite prevalent during the holiday season. The story of the first Christmas tells of the wise men and the shepherds following the star that led them to the beautiful nativity scene. No matter what your religious beliefs are, I am referring to The Star in the story being a sign of hope. Pulling The Star for today's Intuitive Tuesday is a sign of hope...beginning with you. Hope for you, your family, your community, our world. It reminds me of when I was growing up. I LOVED our Christmas Eve service. Still do. We'd sing familiar carols, hear the story of Jesus' birth, and end the service by singing Silent Night. Each person was given an unlit candle as he or she walked into the service. When it was time for Silent Night, the pastors would light their candles from the eternal flame of the altar candle. The lights would dim, and the flame would be passed one candle at a time until the church was glowing -- all while we were singing one of the most beautiful hymns, Silent Night. I feel like The Star is just like the candle lighting. It begins with me and moves out to others, spreading its hopeful light. This season (and from here forward), may we each recognize, internalize, integrate, and radiate the energy of The Star starting right now, beginning with me, with his breath, extending to you and others. Just like scattered points of candle lights growing into a beautiful glow...by beginning with me...I can make a difference. Thank you so much for the beautiful reading Sheri. Best wishes of joy and peace to you and your family this Christmas season and always! Having shared so many of those Christmas Eve services with you, I am so excited about the image of a Star igniting, uniting, glowing, spreading, warming, and illuminating humanity. "The Star reversed came up today to remind you that all is in order...even if it doesn't happen as quickly as you would like." Well, this rings true. I've been trying to be patient, but it can be hard. I'm trying to trust the universe, however challenging that may be for me. I thought the lunar eclipse on soltice (or was it the night before) was really powerful. Not that I really know anything about these cosmic events, but it just felt that way to me. Perfect Moment Monday -- Hallelujah!